When we first put the feeder up, the chickadees were the most common birds coming to visit, by virtue of the fact that they were the only ones who knew about it. Now that the word has spread, and we’re getting more species, the Blue Jays might be more frequent visitors. Undoubtedly, they’re the ones going through the most seed. 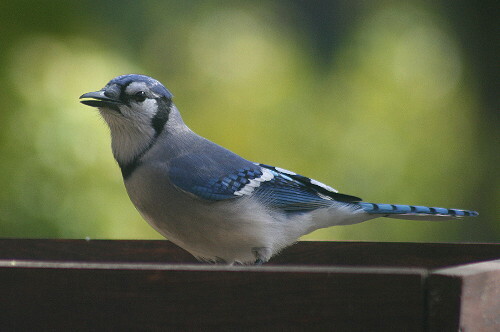 Blue Jays (Cyanocitta cristata) are real characters. They belong to the family Corvidae, which includes the jays and crows, generally felt to be one of the smartest groups of birds. For instance, jays often learn the call of the hawk species that inhabits their area, and then scream it out as they’re approaching a feeding station. At my parents’, they mimicked the Red-tailed Hawk; here, they do Red-shouldered Hawk. 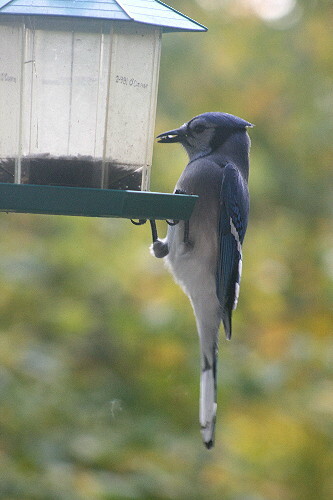 They’re pretty good mimics, and it’s usually enough to cause the birds already at the feeders to scatter, allowing the jays to have their pick of the food. They’re also loud, vocal birds. Seeing a silent jay is much less common than seeing one that’s calling. In the fall and winter jays band together in loose groups, and their calls are partly used for communication between group members, keeping everyone together. Personally, I also think they just like to hear themselves talk. 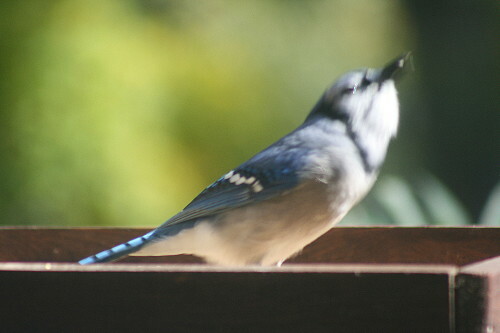 They have a wide variety of regular vocalizations, but their most common are the “jay” from when they take their name (although it could also be derived from an old German word, “gahi”, meaning “quick”), a “queedle-queedle” that sounds reminiscent of a squeaky closthesline, and various whistles. And beyond even that, jays are gluttons. Or, at least, they get that reputation. 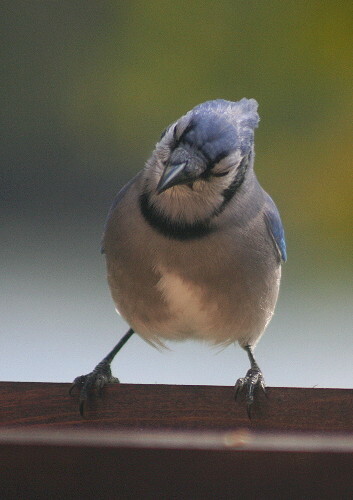 Blue Jays have a pouch, or pocket, in their throats that they can tuck seeds in to, allowing them to pick up 10 to 15 at a time from a feeder. In the above photo this jay is throwing a seed back into one of the pouches. Usually when you see this behaviour it’s not because they’re greedy or especially hungry, but rather that they’re taking the seeds off to cache, or hide elsewhere. They use this behaviour to help ensure that they’ll have food to make it through the winter if heavy snows or prolonged weather prevents them from finding any at any time. Jays aren’t the only birds that cache seeds from feeders, chickadees will also, and squirrels if they’re allowed to visit. 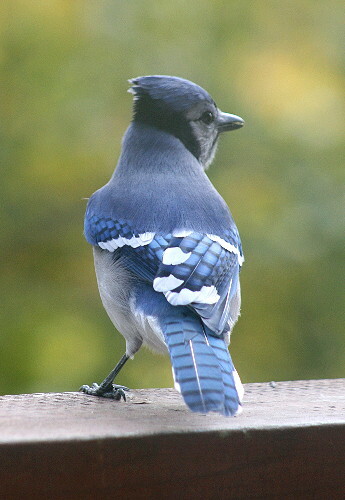 In nature this behaviour would often apply to natural food sources such as acorns, and a single jay can cache up to 2000 to 4000 of them in a season. 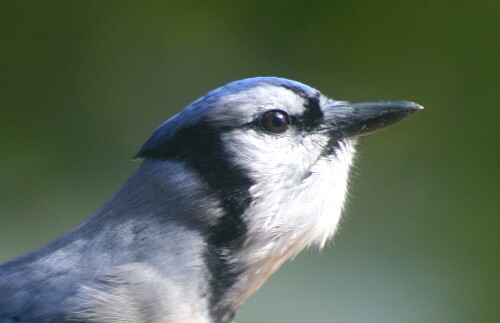 The jays only remember the locations of about 30% of their caches, using memorized landmarks to retrieve them, so inevitably some of the buried seeds will end up germinating. In the case of acorns, maples and other native species, this forgetfulness does the trees a favour in helping to get their seeds off to a good start. 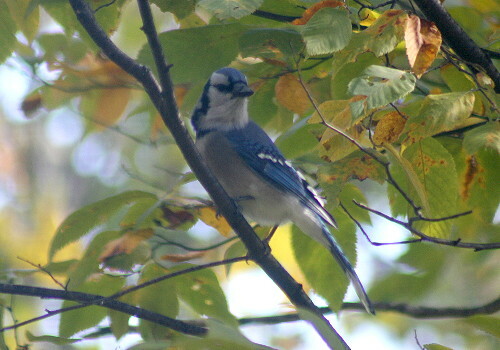 Not all jays will cache seeds, depending partially on local food availability. The ones at my parents’ wouldn’t do it so much, but most of the ones here seem to. Or perhaps I’m just watching them more here. They’ll stuff their throat pouch till it’s bulging, and then take off to go hide them. Although we tend to think of them as year-round residents, Blue Jays are actually a migratory species. Some will stick it out through the winter, but many hoof it south to more favourable climes, particularly in the most northern regions of their range. Blue Jays are found through virtually the entire east and Great Plains, and west through the Boreal forest, just nosing into northern BC. In the west their niche is filled by the Steller’s Jay (C. stelleri) a striking jay with an all-blue body and black head, and little blue (or white, depending on the subspecies) eyebrows. One of my favourite birds of my trips west have been these guys, both for their striking plumage and their character. Migrating jays can be seen in flocks of anywhere from half a dozen to a few hundred. If you’re in a migrant-concentration area, such as a peninsula or a valley, you’ll often see jays flying high overhead in huge, silent groups in the fall. In a single morning in September it may be possible to see a few thousand go by overhead. These birds won’t go really far, just far enough for food to be easier to find come winter snow, a little like the juncos or some winter finches. Although not a strict rule, larger birds generally live longer than smaller ones. Blue Jays have been recorded to live up to 18 years in captivity, though the chances of a wild bird even coming close to that age are fairly slim. Wild jays may live up to 6 years on average, usually succumbing to predation or weather pressures before they have a chance to experience old age. Various hawks, particularly the accipiters (Sharp-shinned, Cooper’s, and goshawk) are their main predators, being bird-specialists, extremely agile in woodland settings. The highest mortality rate occurs before the birds reach their first birthday, though, as they’re either helpless in the nest or still learning the ways of the world. This is why birds generally have such large clutches: most of the young won’t make it, even if they manage to raise them all to the point of leaving the nest. Blue Jays are known for their bold behaviour. Falling in this category is mobbing. If you suddenly hear a big group of jays kicking up a fuss, shove your feet in your shoes and hurry out to see what it’s all about. Chances are there’s a hawk or an owl perched in a tree and the jays are expressing their displeasure, trying to encourage the bird to move on. Crows, weasels and foxes are also fair game, since they’re all potential predators of adults or their young. This mobbing behaviour is an adaptation that helps improve the survival of young (a predator that is driven off is one that isn’t eating your children). Although it seems like the adults are taking their life in their figurative hands, predators rarely try to attack them, usually because the birds are too quick for the predator to make a successful snap at one. Birds will usually mob in large groups, which also helps to protect individuals, since even if one was taken, the rest of the birds would continue dive-bombing the predator. I suspect mostly the predator just feels annoyed at being pinged on the head, and finds it easier to move on than try to catch one of these amazingly quick aggressors. The jay, throat pouch full, crouches to take off for wherever he’s been hiding things. Jays really are very pretty birds, but overlooked because they’re so common. 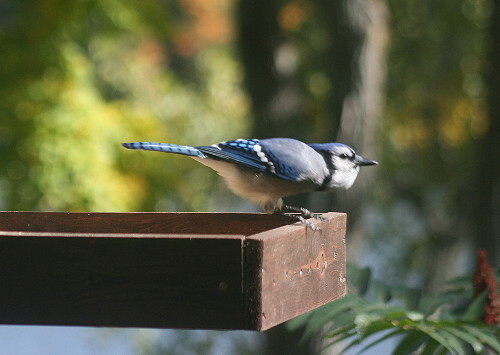 They’re entertaining to watch, even if they do go through our seed at an incredible rate, and they add a beautiful splash of blue to the feeder-scape. Hopefully as we get closer to winter they’ll get over their caching behaviour and just settle in to normal feeding (though they may carry on all winter). What a fascinating bunch of information! The mobbing I knew about; the throat pouch I didn’t; and as for mimicking hawks, I’m — to use a great-aunt’s favourite term — flabbergasted! Blue jays always have struck me as being a smart, adaptable bird … sort of in the same tradition as the crow, but more glamorous. Is there any truth in that? What beautiful and charming photos! I’m glad I was alerted to your site (through google alerts). You’re very knowledgeable about the Blue Jays, and I, too, learned from reading your entry. Enjoyed it very much. Thank you. Hi Seabrooke, Great post on the Blue Jay! Lots of good information. We have Western Scrub Jays and the Steller’s Jay you mentioned here in Northern California. This time of year they are caching acorns from our bountiful oaks and visiting our feeders, both sunflower and suet. They mimic the Red-tailed Hawks to a tee here. The other morning I walked out the front door to hear the mimic from a small scrub oak and knew it wouldn’t be a RT that close to the house perching (ya gotta get up a bit earlier than that to fool me Mr. Jay). Happy Birding! Have a great fall season!